Being a college student means one thing, being broke. It seems as if all of our money either goes to Dunkin Donuts, Chipotle, or Ray’s long islands. After all of these expenses our measly part-time job paychecks only leave little to add to our fashion funds. We, being the frugal young adults we are in turn buy cheap clothes from stores like Forever21 and Zara, but what we don’t realize is that these stores that offer “fast fashion” are just one of the ways the fashion industry is responsible for killing our environment. One of the leading fashion industries responsible for having a harmful impact on the environment is the leather manufacturing business. For starters, the process of turning animal hide into leather is called tanning, this process in a sense is taking a biodegradable product (good) and making it less susceptible to decomposition (bad). The tanning process harms our environment by creating thousands of pounds of toxic sludge composed of the leftover hair, protein and flesh from the animals. This sludge is carelessly leaked into the water supply of countries like India and Bangladesh where tanneries exploit their cheap labor and lenient environmental laws. So not only is this toxic sludge polluting our water it is poisoning us too, great. Don’t worry, that isn’t the only harm leather does to the environment, or to us. 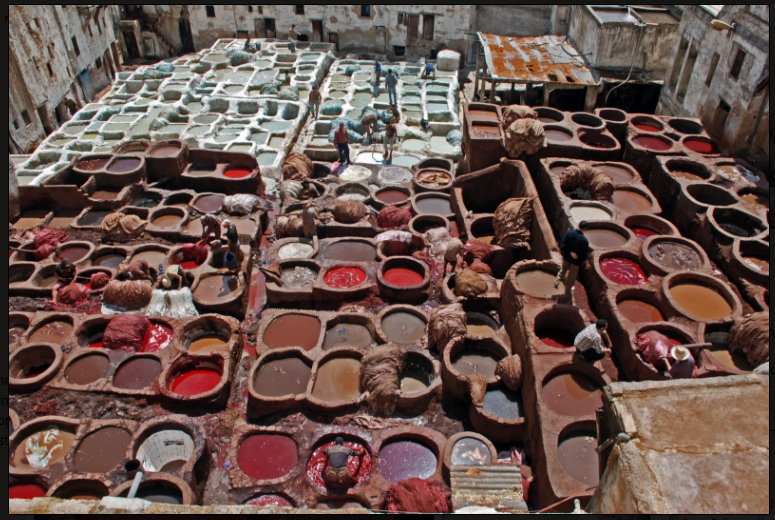 According to People for the Ethical Treatment of Animals (PETA) tanneries use dangerous substances like formaldehyde and arsenic during the tanning process. Tanneries use these chemicals to prevent damage to the hide, but in turn, they damage us. Arsenic is a chemical that is well known for causing diseases like lung cancer if ingested for a period of time. Aside from being ingested these substances also make up part of the toxic sludge found in our water supply. Lets just say leather is doing enough harm to our environment that people are working to revolutionize the industry. One company in particular is a start up from Brooklyn, New York, called Modern Meadow. Modern Meadow has been working towards creating a leather-like substance free of any animal product. CEO Andras Forgacs and his team use a substance found in animal skin called collagen to grow cells. Collagen is found in animal tissue and provides elasticity, firmness, and suppleness. They then work off of these cells to produce collagen that resembles the same flexibility, texture, and elasticity of cowhide. As exciting as man-made leather is, the best part is how much better this process is for the environment and the consumer. Modern Meadow’s method of growing leather doesn’t involve any left over hair, skin or sinew, which means no toxic waste. Also with the use of collagen there is no chance of liming or toxicity that results from the harmful substances they use in the dye and tanning process. Modern Meadow is working to revolutionize the leather industry by using nature to solve our sustainability problems. Although their leather won’t hit markets for a few years they are working tirelessly to transform traditional leather and save our environment.